A complete dinner in a pot! Heading out of February, it dawns on me that winter is getting away from us. And lets face it, even a die-hard lover of cold, snowy days like me, is ready for the warmth of spring. But before we get to far ahead of ourselves, let us not forget that March can be a cold, windy, rainy month, and there are still a few Saturdays left to stay indoors and cook! Tired of my traditional fare, I was going through my soup archives when I looked up at the kitchen TV and saw a rerun of Paula Deen making "Un-Stuffed Cabbage Soup"! I made this before and it was fabulous and why I hadn't thought to make it earlier this season is beyond me. 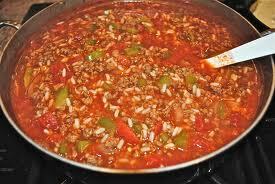 Not only did I make this last year, I altered the recipe just a little to make "Un-Stuffed Pepper Soup"! (I actually liked this better)! But both versions are good stick-to-the-ribs, dip in the bread, slurp when no one else is around, kinds of soup. When it comes to soup, an empty pot is like a blank canvas to an artist...do what you want to it!! So be adventurous and take this winter out with inspired creativity! Try one or both of the following recipes! For the meatballs: In a large bowl, combine the ground meat, rice, salt, pepper, cumin and onions. Form into 1-inch balls and set aside while you make the soup. For the soup: In a 6-quart pot, sweat the garlic in the olive oil until white in color. Add the onions and sweat until translucent. Then add 1 1/2 cups water, the carrots, tomato paste, brown sugar, ketchup and whole tomatoes with juice. Season with salt and pepper and simmer at a lively bubble for 10 minutes. Crush the whole tomatoes with a potato masher or fork. Continue to simmer until the carrots are tender, about 10 more minutes. Working in batches, transfer the soup to a blender and blend until smooth but not pureed. Return the soup to the pot. Remove the cabbage ribs and cut the leaves crosswise into 1/4-inch ribbons. 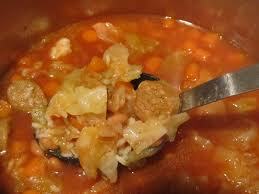 Add the cabbage to the soup and stir to incorporate. Add the bay leaf and simmer over medium-high heat for 10 minutes more (the cabbage should be reduced in size). Add water to thin the soup to the desired consistency. Add the meatballs and simmer for 25 minutes. Add the lemon juice and raisins 10 minutes before serving. I basically used the same recipe above with the following alterations; I eliminated the brown sugar, cabbage, lemon juice and raisins. (I also did not garnish either soup with sour cream or fresh dill). Since I personally favor a thinner soup broth, I reduced the tomato past to 1/2 cup and added a cup of chicken broth instead. I then cleaned and cut up three large green bell peppers that I added rather early in the process so they could soften and flavor the broth. It was amazing! As the nights start to get a little shorter with daylight still streaming in through the kitchen window at dinner time, it will be tempting soon enough to head out onto the deck and light the grill, but for now, let's slow down and enjoy the comforting warmth that a pot of soup on the stove brings to us. Please let me know if you make one of these fabulous versions!! As many of you know, we are putting our house on the market and I have been preparing for its coming out party in a few weeks. The biggest challenge has been the tiny little rooms where we hide stuff we just can’t seem to throw out, things we hardly ever use or even need, the small areas we store memories…the closets. In another closet was the art work of my son Kyle who, when in second grade, had to design a poster dealing with home security. Knowing that we kept a baseball bat under our bed, his poster simply read “My Dad sleeps with an old bat”. I kept it then. I’ll keep it now. In three different closets, were three different Pilate balls, three different colors…all still in boxes. Enough said. In my sons’ Trevor’s closet, I found, 2 baseball gloves, 2 pairs of old cleats, broken hockey stick, a high school football helmet, volumes of baseball cards and a well-worn magazine that I’m sure he wished I never found the first time I saw it many years ago. The same magazine that fell from the top of a bathroom cabinet that was being removed by contractors who were remodeling. The same magazine that landed to a spread eagle centerfold and when the workers all looked at me, I could only reply “it’s not mine.” I guess my son did not trash it as I strongly suggested back then. Taken care of now. The downstairs hall closet is where I found an assortment of things spanning through the years. I found four different sized winter coats of mine, all now of which are too big, none of which I wore unless I was shoveling snow. Those who know me well know that I seldom wear coats. But that’s another story. Continuing in that closet I found 7 right handed winter gloves, 9 left handed. None of which matched. Then amongst all the Phillies and Eagles hats and scarves, I found the item that still tugs at my heart more than I expected. Stored in a plastic bag I found the leash and a small container of soft brown fur that belonged to our chocolate lab, Maxine, who died a few years ago. I can still see her brown eyes as she would lay her head on my lap while looking up at me. I so vividly see her lying at the top of the stairwell until both boys were in the house for the night. Only then would she retire to her favorite spot. She amazed me. She comforted me. And I miss her to this day. I have more closets to tackle, more cabinets to straighten out, more clutter to organize. Slowing me down are the memories. There are just so many things in our homes that we don't need and will never use again. And yet, discarding them is painful. When your downsizing, space is at a premium. But the clay hand prints from pre-school, the home-made Mother's Day cards, and the pencil holders made from Popsicle sticks have to find their way into the new much smaller home. They are part of what made us a family...and they're coming with me. Now, what to do with all those trophies? Facebook & Recipes...Yeah, I like that!! Perfect paring with coffee or tea! Recently, I read some rumblings on Facebook about ads running on the side of the page. People are finding them annoying and intrusive. I usually save those terms to describe people. I, on the other hand, also understand that even Facebook has to make money so the rest of us can continue to use this popular social media site for free, so am not that bothered by them. In fact, recently I kept catching a glimpse of a delicious looking Orange Cream Cheese Bread, from a site called JustAPinch.com, that I had to click on it (something I never do for fear of accidently “liking” it), but I was so glad I did. First of all, it was easy. I like easy. I am more of a cook than a baker so it was rare that I chose this recipe to click on. After reading it, I “Pinned” it, something else I’m new to, so I could check it out later. And I did! On a cold, snowy Sunday, I decided to give this a try. Soon the house was filled with the aroma of something good in the oven! It was amazing. Combine cream cheese and shortening, creaming well. Combine flour, baking powder and salt; add to creamed mixture alternately with milk, beginning and ending with flour mixture. Mix well after each addition. Stir in walnuts and orange peel. Pour batter into 2 greased and floured 8-1/2 x 4-1/2 x 3 inch loaf pans. I, as usual, substituted half Splenda for half of the sugar, but it worked very well. One of the things I like about the site Just A Pinch, is reading the comments from people who have already used the recipe. There were questions on what type of shortening to use (the originator used Criso), others used butter or margarine. Seems it doesn't really matter, so I used butter. Many added other things like raisins and dried cranberries. And as wonderful as that sounds, I didn't have either in the pantry so the standard recipe was what I went by and added of dusting a powdered sugar when cooled. 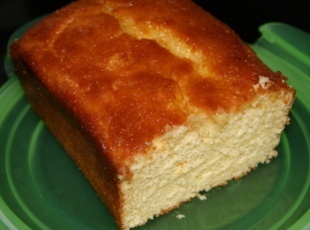 It was really more of a pound cake than bread, but it was moist and so flavorful, that I actually did “like” JustAPinch.com Facebook page so I can see what they are bringing up next! Best thing about this site, is that it is a great collection of recipes from home kitchen cooks, like us! So don’t easily dismiss all those ads that appear as you are checking on your Facebook friends. They actually may have something good to offer! Oh wait a minute...I just checked Facebook and JustAPinch.com has posted a "Brownie Chocolate Cheesecake" recipe! I have a wedding in five months to get ready for! Someone else please make this and report on results! On second thought, maybe I should avoid the ads for a while. What a lovely thought. 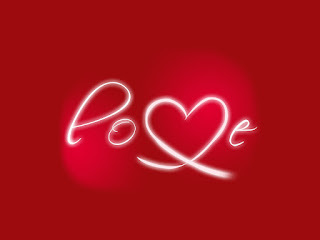 Celebrating the love and warmth of friendship is a concept that is under looked. And Valentine’s Day may just be the day to do that. Since so many in our group are on the single side of cupid, February 14th is a day where it is so easy to look the other way for 24 hours. It took my friend Judy to see that all types of love should not only be recognized, but celebrated and thoroughly enjoyed as well. Our group embodies the celebration of life itself. We have traveled the world together. Through the pubs of Ireland, the hills of the Tuscany countryside, the tapas bars of Spain, the wine vineyards of the Napa Valley to four-wheeling in the Alaskan mountains, we have laughed till we cried. And at times, we have cried till we laughed. It is the best kind of laughter. The break down the walls, kick the door open, change your underwear kind of humor that gets to us every time. But even more important are the times when life is not so funny. The times when you need a friend to take your arm and guide you down an unknown path; it is certain that someone will step in and prevent the other one from hitting the ground face first. The presence of this friendship is a constant. It is a blessing I will be forever grateful for. So with that in mind, I will take Judy’s advice this coming Valentine’s Day and celebrate all the loves of my life! To my sons, Trevor and Kyle who monopolize every chamber in my heart, and to the girls that they hold in theirs, to my sisters, who have proven their rock solid devotion over the last several months, to my brothers and their wives, who've been there even through the miles, to my nieces and nephews, all of whom I love as my own, I send the best that Valentine's Day has to offer. Through my friend, I have been reminded to celebrate life this Thursday and all of the different types of love that it encumbers. I will have dinner, drink wine and laugh, I'm sure. And I wish, the same for my family and friends, along with the ability to embrace all that your heart can hold...because I love you all. It's Mid-February...Where are your resolutions? I went to the gym this morning and noticed that the crowd is getting smaller. January resolves are slowly melting as the days get slightly longer. I had two resolutions this year; get healthy, get stronger. I think I’m doing okay on those two, but I couldn't help thinking about the general resolutions, the ones we all make to better our lives. I looked up the top 10 resolutions to see how my own affirmations have held up. Take a look and see where you are with this! 1. Resolution #1 Fitness – The American Council on Fitness claims that 66% of us are out of shape. They’re not talking about being overweight, that comes next. They are referring to everyone, even thin people, who lack regular exercise. Just because you’re body mass index number is low, doesn't mean that your heart and other muscles are in prime condition. Me – I’m holding my own with this one. I can honestly say that my heart rate after three miles on treadmill is much lower than it was last October. A nagging back issue which has been diagnosed as “spinal stenosis” slows me at times, but does not stop me. 2. Resolution #2 Lose weight. Diets are prime among those who plan to win Resolution #1. Weight Watchers, Jenny Craig and Atkins don’t run all those expensive January ads for nothing. We start looking up diet programs as we are sucking on the last candy cane. Me - Okay…now we’re singing a tune I’m familiar with. A life-long battle with the bulge will remain just that – a lifelong battle. Not that I’m not addressing it, it is just a partner in the ring that I will always have to go a few rounds with on occasion Formerly mentioned back issue caused severe spasms that kept me out of the gym for three weeks, and I gained 10 pounds. I’m back in the ring and have knocked out the 10 pounds, but the gain served as a reminder that I can not lower my guard. 3. Resolution #3 Quit Smoking. I have never smoked but totally get that it is a very strong addiction. Since my own will power gets tested on a daily basis, I don’t judge those that face this particular issue. I do, however, wish strength on those I love because it is such a harmful habit. 4. Resolution #4 Enjoy Life – Recommendations are that we slow down and learn to appreciate all that we have. 5. Resolution #5 Quit Drinking – Not happening right now. Read above. 6. Resolution #6 Get Out of Debt - First step is making a budget; second step is sticking to it. Economists all agree on one thing; unless it’s a breathing machine, if you can’t pay cash, don’t buy it. Me - Of all the resolutions mentioned, this may be the hardest one. Especially since some things are not under my control. But I have learned restraint, and for the most part, my credit cards have been left untouched since the start of the New Year. So I may be getting a hold on this one. 7. Resolution # 7 Learn Something New – Break out of your comfort zone and bring something new into your life. Me - Wow! I have learned a lot already in 2013. And mostly about myself! Not a bad thing either. 8. Resolution #8 Help Others – Get involved. Volunteer. Give something of yourself to the world around you. Me – I have learned that no matter how tough things may seem, there is always someone else who has it worse. I have experienced how good it feels to get your mind off your problems and extend a hand. There is always someone who will warmly and appreciatively grasp it. 9. Resolution #9 Get Organized – Organization is the key to controlling your life! 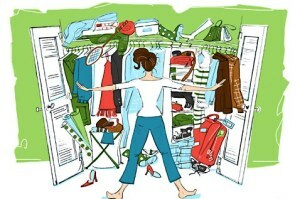 Me – If you really want to do this, go through each closet and drawer with two boxes marked either “trash” or keep”. It is that simple. Or you could do what I am doing…put your house up for sale. It is a mandate for organization! Resolution #10 Read More! Yes, please do! I am working hard to make this a great year so follow Kitchen Clatter over the next several months; through the wedding, through some personal stuff, through the kitchen, and through life...the best it yet to come! 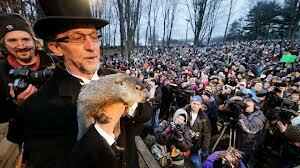 How to Beat Winter...And the Groundhog! I don’t have much faith in the weather predicting skills of a ground hog. There were at least seven cameras with lights shining on him when the infamous moment came as to whether he would see his shadow or not. I saw his shadow. He didn't Maybe Punxsutawney, Pennsylvania should spend less money on promotion and more money in getting the little guys eyes examined. Anyway, it has already been much colder this winter than the last two years. Days are still short, Nights are still long, and the sun is still MIA most afternoons leaving most of us on the grey side. So whether we have just a few more or six more weeks of bone chilling temperatures, we need to find ways to keep motivating ourselves. 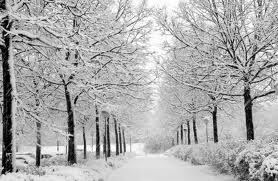 Let’s face it, winter is Mother Nature’s way of saying “Go to your room and don’t come out until I tell you”. So let’s get a little rebellious and find a way to get around her! 1. Get up! That’s right, take off the afghan, put down the tea and get off the couch. It is going to be a looooong six weeks if you plan on spending it with one eye peeking out from under a blanket catching up on the first two seasons of Downton Abbey. 2. Walk! Exercise is to depression what bleach is to a wine stain (I have experience in both lately), it erodes its presence. Bundle up, put on some gloves and get moving! 3. Once back home, get cooking! In the last three weeks, over a thousand people have downloaded Kitchen Clatters, two chili and the Maryland soup recipes. Get them going. They will warm the house and the soul. 4. And with that in mind, invite some friends over. Wine and warming food is a great way to spend a winter’s night. For some reason, we tend to stop entertaining after the holidays and slip into hibernation mode. Break the cycle. Have a party! 5. And here’s a thought, if there is one in your area, spend the afternoon at a home show. There are so many pool and spa vendors, patio and BBQ contractors, that you will definitely see the light at the end of winter’s tunnel. Just coming home and putting a budget together gets you one step closer to spring. 6. (Saved my favorite suggestion for last). Eat expensive dark chocolate! Yep. There is a natural hormone known as serotonin which the body manufactures when exposed to the sun. It makes you feel good enough to break out the happy dance. Now here is the best part, in the absence of prolonged sunlight, the amino acid tryptophan which helps promote serotonin, is found in the bean that produces high quality chocolate. Generally, the more expensive the chocolate, the higher the tryptophan count, the less sugar used. It’s a win – win situation for everything but your wallet. So anti-up and dig in! As northerner’s, most of us thrive in at least three of the four seasons of our geographic setting. But as it takes rain to make a rainbow, clouds to make a spectacular sunset, it takes winter to make spring, summer and autumn the special seasons that they are. With a little effort and a pinch of imagination, that fourth season can be just as fabulous… okay, or at least do-able. I like winter, most days anyway, although I can live without ice. But each day I find something that keeps me moving. Something that keeps me motivated, something that requires more thought than it takes to just heat up the tea kettle. But next February, I’m thinking of stepping outside of my comfort zone and heading to Punxsutawney, PA. I’m always looking for different things to do in the winter and there is a groundhog there that needs to be replaced. I'm breaking out the top hat! I could use the notoriety and apparently good eye site is not required.